I’ve had this post in my head for a while and had not given myself the time to write it. Yesterday I think I wasted at least 2-3 hours of my day on Facebook and was annoyed at myself for doing that, so I thought enough was enough. For some reason, Facebook is the only social network that I have this kind of up and down relationship with. Twitter I love – I only ever really use it for stuff related to my work or to education in general and dip in and out of it when I need or want to. I never feel pressure to keep checking it and can easily go days without it. It is rare that I look at it on a weekend and whenever I do engage with Twitter, it’s usually for something useful. I also love Snapchat, Instagram and Whatsapp. I suppose the latter is more like texting anyway and Snapchat is a bit like texting but with added fun. I enjoy living vicariously through friends and relatives of mine who are still students and keep their ‘stories’ updated with their midweek night out antics, while I go to bed at 10pm. Instagram is brilliant too. I never have a bad experience when I look at Instagram. There’s some nice photos, I can like them if I want to, I can comment if I want to, then I leave. I go through phases where I don’t add photos myself for days or weeks at a time but I do always like to go back to it. Since both Instagram and Whatsapp are owned by Facebook anyway, they probably don’t care which platforms I’m using – despite them claiming to care about me and the memories I share. Look! Here’s a memory from 8 years ago! We really love you, Rosie! Ever since I read Sherry Turkle’s Alone Together a few years ago, it’s really made me re-think my relationship with technology and how I want to ‘be’ in a world filled with different devices and constant ways to get in touch with people electronically. If you can’t be bothered to read the book, there is a 20 minute TED Talk you can check out instead. Turkle’s work has involved decades of research into humans’ relationship with technology and warns us to be critical and mindful of how we relate to each other and communicate via technology. Turkle suggests that smartphones and tablets have changed us psychologically and have made us behave differently. I am inclined to agree. I have yet to read her latest work, Reclaiming Conversation, but there is also an hour long Talks at Google video on that if reading a book is too much of a commitment. The jist of her latest work basically suggests that we are currently in a crisis of empathy because of the methods of communication we now use and the way we ‘present’ ourselves online. We’ve forgotten how to relate to each other in one-to-one conversation. On Facebook, we can curate a perfect version of ourselves and only show the highlights, the ‘best bits’ of what’s happening in our lives. We can edit what we write as part of our updates or as part of an online debate and the nuances of conversation are lost. I am as guilty of this as anyone. Why wouldn’t I want to show people how much of a good time and how much of a fun person I am? I don’t post anything on Facebook unless I want people to react to it or comment on it. What would be the point, otherwise? I’ve also been on the hurtful, receiving end of being blocked because something I have written down has been taken out of context. In this online world, we are absolutely not allowed to make a mistake and, in some cases, we’re not even able to back up what we’ve said or explain how something has come out wrong without someone deciding that that’s it. Our presence in their online world is no longer wanted. My professional life is all about how technology can enhance teaching and learning. Lecturers approach our team with a teaching and learning ‘problem’ or ‘need’ and we advise on tools that will help them achieve what they want. However, we would never just recommend a technology for technology’s sake. The teaching and learning need ALWAYS comes first and no single tool or technology is a magic fix. Lately, I don’t feel that Facebook enhances my personal life at all. I actually feel like the sheer amount of information on there has made me care less about those who are posting it. I can’t put my finger on why it is only Facebook that makes me feel this way and not other social networks. There is definitely something psychological about posting something on there and then going back to check for ‘likes’ or comments. Perhaps the problem is me and not the tool? 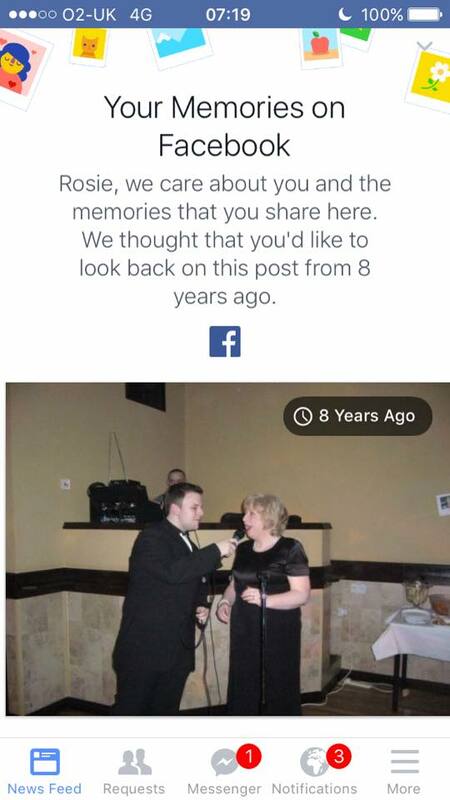 I’ve had a Facebook account for 9 years. That’s longer than I was at secondary school, longer than I was studying for a degree, longer than any job I’ve ever had. Perhaps I expect more from Facebook than I do from the other social networks that I just dip in and out of because of the sheer amount of time I’ve spent on there and how embedded it is in my life. It worries me that the more time I waste on Facebook, the less time I’m talking to family, friends or my partner. The more I see ‘broadcasts’ about people’s perfect lives, the more I become desensitized and less empathetic towards posts because I don’t necessarily feel like I would want to present myself that way online. It has become a bit of a laugh to joke about ‘You OK hun? !’ type posts where people post something, fishing for attention and then say ‘I’ll inbox you, hun’ when someone asks what’s wrong. Why has it become funny when people might actually be really struggling and don’t know where to turn to for help? I’m not trying to say that I all of a sudden don’t care about friends or family. I can see many benefits of Facebook. I’ve been able to stay in touch with friends who live in different countries in ways I would never have been able to 20 years ago. You can keep in touch with those who you would have otherwise lost touch with and use it to organise social events quickly and easily. However – now that there are so many ways to get in touch, it can be all the more difficult when we expect people to reply quickly. We’ve all been there haven’t we? When the Facebook message has been ‘seen’ but no reply comes? And what’s the first thing you think? That they don’t care or can’t be bothered with you and obviously don’t want to prioritise your message. Not that their internet might be broken, they’ve dropped their phone down the loo or might actually be going through a hard time. I do think that, for all its benefits, technology has made us more demanding of each other and less empathetic. My aim from now on is to be more aware of this and attempt to be better. For now, this will probably mean having a cool-off period from Facebook until I can learn to love it again and use it in a way that doesn’t make me feel negative. A really interesting post Rosie, with lots of food for thought. I agree with a lot of what you’ve said. I think Facebook, along with other social media platforms, is a place where people display a very much curated version of themselves. Like you say, you wouldn’t post unless you want someone to see it. Have you heard of Goffman’s dramaturgical theory? Essentially, “all the world’s a stage” – we have Front Stage performances (out in public, work, etc) and Back Stage (at home, on our own, with our very closest friends/family). I see Facebook as an extension of that, it’s a Front Stage place. It’s a way to share your every thought and action, but people are still very carefully ‘performing’ these. And I am not different. I take several photos of the same thing and pick the best; I post about impressive (or so I hope) things that I know will get a response. A caveat to all this – I only have 70 or 80 friends on Facebook, which I think is fairly unusual for someone my age (generalising wildly!) so I know I am actually posting these things to real friends and family. I’ve never heard of Goffman’s dramaturgical theory but I will definitely read up on it, it sounds really interesting. Perhaps my problem is that I have too many people on my Facebook. I went through a phase of accepting anyone and everyone, as long as I’d met them ‘in person’ at least once. However, I now have over 700 ‘friends’ and this must definitely contribute to the ‘information overload’. I think I’ve shared my views with you on this on other forums (Facebook ironically…but also Twitter)…but thought this was also worth sharing (link to the research at the end)…it’s a few years old now, but still might be of interest! Yes, you did share these previously but I’ve only just got around to reading them. Some good stuff in there. Definitely an area of research where there’s so much scope. Maybe I am more narcissistic and that’s why Facebook has been disappointing me because I feel like I’m not getting the attention I deserve? 😉 ha!